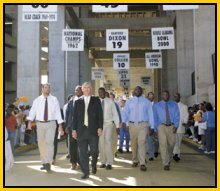 "Great things have happened (Here at Southern Miss), but the future holds even more tremendous opportunities for Golden Eagle Football." Under Coach Bower, the Golden Eagles have posted an impressive 89-61-1 record. In the C-USA era, his teams have posted a 36-8 league record. He is the dean of conference coaches. His 126games coached makes him only the second coach ever to coach more than 100 games, Pie Van the other. Bower also has compiled that enviable record while playing only 43 of those 114 games at home. His teams have posted a 35-8 record in those 43 games, including a 15-3 mark the last four seasons. Overall, his teams have won 32 games while losing just 15 in the last three seasons. Bower's career totals as a player included completing 278 or 506 passes for 3,589 yards and 20 touch- downs. He still holds the USM career mark for completion percentage among players with a minimum 200 pass attempts with a .549 mark. 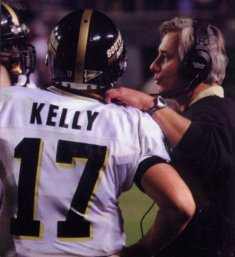 His 1973 total offense mark of 1,706 yards still ranks as the ninth best at Southern Miss, and his 1,495 passing yards in 1973 still ranks as the tenth best in Golden Eagle history. During his coaching career, Coach Bower has coached numerous All-American and All-Conference selections. 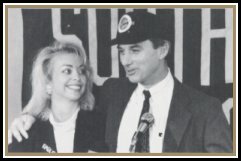 Besides Brett Favre and Reggie Collier, Bower has had a hand in the careers of former USM offensive players Glen Howe, Mike Landrum, Marvin Harvey, Louis Lipps, Sammy Winder, Fred Brock, Terry Hardy, Michael Jackson, Harold Shaw and Tony Smith, all of who went on to play professional football. In addition, four of his 1999 player were drafted. including receiving standouts Sherrod Gideon, Todd Pinkston, and line-backer T.J. Slaughter. Jeff and Debbie Bower bleed Black and Gold. 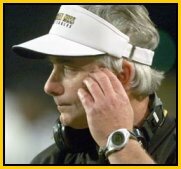 Coach Bower received his MBA in management from Southern Miss in 1978, is married to a former Miss USM (1975) and Miss Mississippi USA (1972). The former Debbie Pawlik, who was a USM cheerleader and a member of the Kappa Delta sorority while at USM, graduated with a nursing degree in 1975. 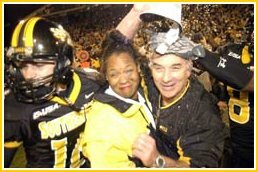 She remains active in the USM Eagle Club and with a variety of other USM promotional efforts. The Bower family, which includes their youngest daughter Stephanie, survived a gut wrenching tragedy in 1997 when they lost their 17 year old daughter Kristen in an automobile accident. The Southern Miss, and the entire Hattiesburg community rallied around the Bowers in an unprecedented show of love and support following the accident. It is obvious where the team gets it's character, heart and courage! If I won a million-dollar lottery, I would... endow a scholarship at USM, invest the rest. 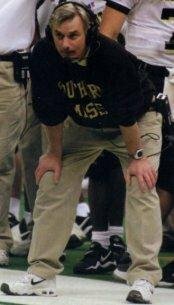 "I am happy here and plan on staying at Southern Miss as long as they will have me. I am here for good."